CHAPEL HILL, N.C. — Back in the 1970s, when Nathalie Dupree andShirley Corriher were cooking together in Atlanta, they wanted to avoid the kind of relationship in which competition slides into rancor. Eliza had the opportunity to meet up with fellow farmer Suzanne Nelson of Cozi Farm, chef Jeff Barney of the Saxapahaw General Store and The Eddy, filmmakerGraham Meriwether and Frank Stacio of National Public Radio to discuss how meat is raised in America. The discussion centers around the new documentary American Meat, that looks at the challenges of modern meat production in America and ideas on how we can better feed out nation. 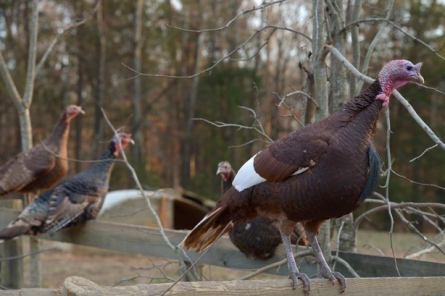 SNOW CAMP — Cane Creek Farm has sold out of turkeys for the year. For most people who buy their birds at the grocery store for $1.50 per pound, purchasing from such a farm may never have crossed their minds. But for a growing number of people who are more conscious about the origin of their food, it is proof that there’s value in buying meat that’s fresh, local and naturally raised. This year, she raised around 70 turkeys that had 400 acres to roam. Most of the turkeys are Heritage breed, which she describes as a wild breed that cooks quickly and has a lot of flavor with little fat. She said her 12-pound birds feed 8 to 10 people with other dishes on the table, including other proteins, and said the breasts are smaller but feet are larger than those of most turkeys available for sale today. This year was MacLean’s ninth raising turkeys. She said in addition to being free-range birds, her turkeys, along with other animals on the farm, are naturally raised. MacLean said the turkeys have been eating things like persimmons and greens, much like what a wild turkey would eat. “It brings to the table this very gamey flavor,” she said. MacLean begins taking orders for turkeys around Labor Day, and said she sold out in early November. Most of her customers are in Orange, Durham, Chatham and Guilford counties, she said, adding that Alamance County has an “older farming crowd” and folks are still warming up to alternative ways of agriculture. But her methods aren’t anything too new, MacLean said. The farm employs two full-time workers and one part-timer to keep up with the turkeys, pigs, chickens, goats, ducks, lambs and other animals there. MacLean said she also will sell Christmas hams. Though the farm is in a period of downsizing — which included the turkeys this year, declining from 200 last year — MacLean said she still plans to continue her work there and to provide others with the same type of food she raises for her own family. To find out more about Cane Creek Farm, including information on how to purchase its products, go to www.canecreekfarm.us. Cane Creek Turkeys Enjoy 2 minutes of fame on UNC TV’s NC Now! Cane Creek Farm’s heritage breed Bourbon Red turkeys enjoyed a moment in the spotlight when NC Now stopped by the farm to film a segment on NC grown Thanksgiving turkeys. Eliza MacLean discusses some of the many reasons that people buy our turkeys, including their amazing taste and the wholesome and humane way they are raised. Does saving a rare breed mean eating it for dinner? In pork-crazy North Carolina, the Ossabaw pig—with a wild-tinged ancient flavor and fat that’s actually good for you—makes a last stand, and restaurant chefs in the know are scattering pearls before (these) swine. Is lard the new olive oil? If that lard (pork fat) comes from an Ossabaw, the answer is maybe. Never heard of an Ossabaw? To be honest, neither had I. Then one cold night not so long ago, I ordered the pork belly with purple hull pea vinaigrette at Ben and Karen Barker’s award-winning Magnolia Grill in Durham, North Carolina. Brilliant! But even the gifted Ben Barker wasn’t magician enough to turn today’s dry, tasteless “new white meat” into anything so luxurious, so complexly flavored, so tender it barely needed chewing. What was this extraordinary pork? In a word: Ossabaw. Strangely, that word would pop up again before week’s end. A friend working at Cane Creek Farm, twelve miles west of Chapel Hill, e-mailed to gush over a new litter of Ossabaws. “You’ve got to come out,” she urged. 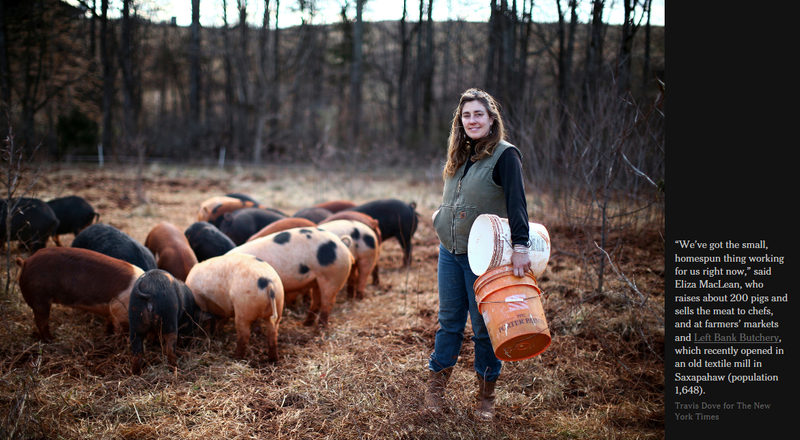 “You must see the baby pigs and meet Eliza.” Eliza MacLean, a slim, 40-ish honey blonde, a single mom of young twins, is one of the few American farmers raising the endangered Ossabaws. And she is doing so—organically—on 11 acres of North Carolina’s rumpled red-clay midriff. Hardly the career path you’d expect of a Philadelphia girl who’d graduated from Mount Holyoke. I drove out to her storybook farm one blue-sky morning. There were pygmy goats eager to nuzzle, fluffy chickens of exotic breed, miniature donkeys. But it was the Ossabaws I’d come to see. And there they were: pointy snouted, with coltish legs kicking up little puffs of red dust. Before hitting the road, I had done my homework. Ossabaws descend from the Iberico hogs introduced to the Deep South by Spanish colonists four centuries ago. Stranded on Ossabaw, a barrier island off the coast of Savannah, they turned feral over time and were reduced to foraging for acorns and whatever else turned up in field and forest. It was a harsh habitat, but the Ossabaws adapted, developing not only the ability to store fat that could sustain them through lean times but also a tolerance for the island’s intensely brackish water. Could Ossabaws, as finely fleshed as the Ibericos and blessed with a similar wildness of flavor, be farm-raised? And if so, how could these qualities be preserved? That’s what the ALBC aims to find out. Enter Eliza MacLean and Cane Creek Farm. After earning a master’s in environmental toxicology at Duke, she volunteered at ALBC, where she met Charles Talbott, a professor of animal sciences at North Carolina A&T State University in Greensboro who was intent on preserving the rare Ossabaws. Soon, MacLean was managing the entire A&T swine herd. When MacLean bought Cane Creek Farm in 2002, she turned it into a sort of Noah’s Ark by agreeing to raise seven Ossabaws as part of studies Talbott was conducting in cooperation with the University of Missouri, Penn State, and Iowa State. Before long, Alice Waters heard about Cane Creek and came to see for herself. She was so impressed, so admiring of MacLean and her mission, that she asked her to speak at the Slow Food Conference in Turin, Italy. Barely a year and a half after she’d begun raising Ossabaws, Peter Kaminsky praised MacLean as a pioneer in his New York Times piece “On the Trail of Fine Ham.” Suddenly, celebrated Manhattan chef Daniel Boulud phoned MacLean for a standing order of pork, as did the chefs at New York City’s Il Buco and Savoy. 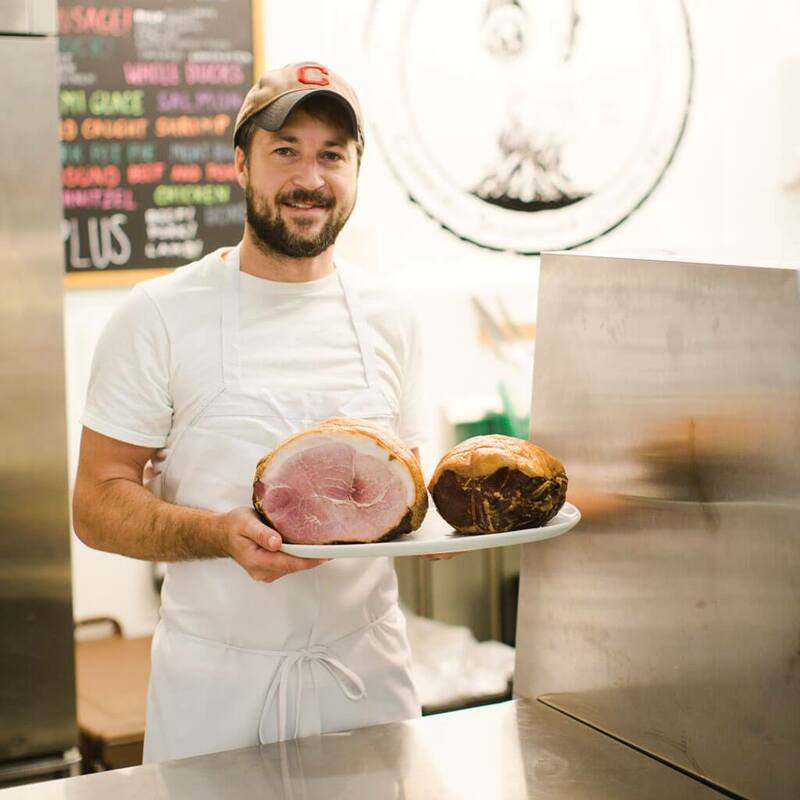 Today, availability permitting, Cane Creek’s artisanal organic pork appears on the menus of such Manhattan restaurants as Gramercy Tavern, Blue Hill, and Blue Smoke and is more or less a staple at a dozen Raleigh, Durham, and Chapel Hill restaurants. Still, MacLean doesn’t short-shrift her faithful customers at the Carrboro Farmer’s Market and other local outlets. Unfortunately, she doesn’t yet produce enough to fill phone orders. The main problem, MacLean explains, is that Ossabaws are smallish hogs that produce small litters. That’s why she’s begun crossing them with Farmer’s Hybrids. Are “Crossabaws,” as she calls them, the answer? Time will tell. Meanwhile, MacLean suggests Caw Caw Creek Farm, in South Carolina, as an alternative source for Ossabaw pork. North Carolina native and longtime Gourmet contributor Jean Anderson has written more than 20 cookbooks on subjects ranging from nutrition to the foods of Portugal. Her latest, A Love Affair with Southern Cooking, is to be published this month. Visit jeanandersoncooks.com for more information.